Sony has started 2018 by launching its mid-range smartphones, the Xperia XA2, XA2 Ultra and L2. But, we are still waiting for a Sony smartphone that will arrive with a new design and great specifications. 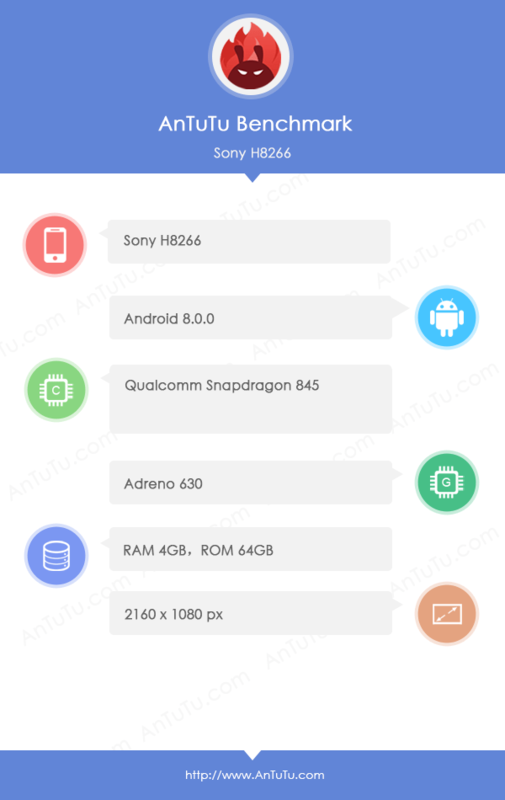 Last year, a couple of Sony phones were spotted on benchmarking platforms with Snapdragon 845 processor, and Sony H8266 was one of them. Today, the phone was spotted on AnTuTu benchmark that has confirmed one of the most awaited features of upcoming Sony flagship, an 18:9 display. Well, as per AnTuTu listing, the phone is coming with an 18:9 Full-HD+ display with a resolution of 2160x1080p. It is quite weird because we have seen some high-resolution displays on Sony’s flagships and even 4K screens on the ‘Premium’ branded phones. Anyways, the phone is powered by the latest and greatest Snapdragon 845 processor along with the Adreno 630 GPU. There is 4GB RAM along with 64GB ROM, and we cannot say if there will be a 6GB RAM variant also, but there should be one! Lastly, Android Oreo 8.0.0 runs out of the box. Well, there is no information regarding the name of this Sony Phone. Stay Tuned for more details.